Total devastation. My world is in upheaval. How could a staple of American culture simply no longer exist? Stop being made? This is a sad, sad time in history. I mean, we already know that. But this is just the icing on the... cookie. 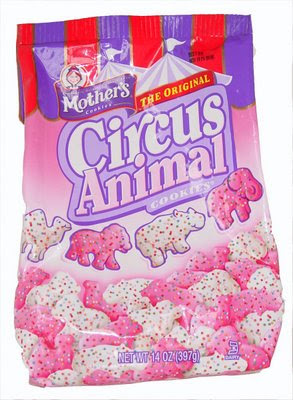 Mother's frosted, lovely, perfectly pink and white Circus Animal cookies have long been a love of mine. High school youth group trips always found me with a bag of those and a Clearly Canadian. I used to ask for these, and get them, on my birthday. A few years ago I went through a spell where my pantry was never without an open bag. Never. If your heart is breaking with me, you can buy this commemorative t-shirt (I would wear a medium, hint, hint). An awful, awful time in history. I have the give the credit for the discovery of this sad and terrible news to my friend Michelle who found out after having this conversation with the checker at her local Vons. I went to 3 stores to get the Circus Animal Cookies. But I still have to secure my personal favorites: The Sugar Wafers. It has made me so sad. My commemorative blog is on the way as soon as all the kids are in bed. Yes, so sad. So sad. I will be stocking up on Mother's cookies so my unborn child will have the opportunity to at least say she had one = ^). Hmmm, I wonder if it would still be good by then. Hmmm, oh well, we'll see.